Conflict is natural among human beings and is a common aspect of interaction because no two people think the same way. Unfortunately, unmanaged conflict often ends up unresolved and in the workplace this can be both costly and damaging to the business. Knowing that conflict is bound to happen, businesses should prepare for it by budgeting and providing training to make working through it much easier and less taxing on all resources. Despite the common nature of conflict, when faced with it, the majority of managers would prefer to run away as fast as their legs can carry them. Who can blame them? Conflict, whether in its initial subtle stage or its later stages of fights and other bad behaviour, is not comfortable for many. We work with management teams in companies who, like most, are aware that things are not perfect within their organization. They know problems exist but underestimate the impact and constantly pull their hair out because they don’t “get” conflict. They repeatedly ask themselves why turnover is so high, when sick days soared in number, how benefits got out of hand and ultimately, why production is down and sales and profits are falling. Consider how conflict evolves to that point. It usually starts with a disagreement, dislike or misunderstanding, but when the conversation doesn’t include healthy, respectful debate that leads to resolution, emotions will be amplified and kaboom, you have conflict. How the conflict plays out depends on the degree of emotion invested in disagreements combined with people’s “regular” communication habits. Disagreement on its own is a usual occurrence in the workplace, which it should be. It is useful because people have different ideas, perspectives and opinions. Disagreements, done right, expand knowledge and understanding. They can also foster respect. The goal is not to get rid of disagreements and conflict but to understand them and manage them for everyone’s benefit. How can companies better understand and manage conflict? Start by getting clear on who is usually involved and determining the frequency that conflict occurs. Conflict between employees who are at the same level is common. As mentioned, different personalities, characteristics and expertise should and will create disagreements. Companies need to have effective and supportive managers to guide the disagreements and facilitate conversations into good resolutions while also encouraging sharing of differences. If managers avoid these employee issues, then escalation occurs, emotions run high and unacceptable behaviour follows. On a different level, when conflict occurs between managers and their employees, it gets far more difficult. Emotion mixed with power differentials will push disagreements into conflict and this state of stress may become the new normal. This is when senior managers and HR will notice a negative shift in metrics and productivity changes, unfortunately often too late. While we’ve established that conflict is quite common, it has a wide continuum. It can range from subtle tension (where it can be resolved between those involved), to being obvious, needing guidance and out of control. Here is a good check list for all levels of management to use to see where problems lie within a team. It is best to have team members answer the questions anonymously. How often does conflict occur on the team? Does conflict involve the same people? What topics contribute to conflict? What are the residual effects of conflict? Is resolution achieved after conflict? What part does management play in conflict? One client we worked with thought they had conflict issues in their business. During our assessment of their workplace, we were able to diagnose the multiple areas where tension and conflict were present. They were not only surprised at how prominent the problems were but even more shocked at how much it was affecting communication, collaboration and production. It was a surprise to them how much conflict was truly costing. 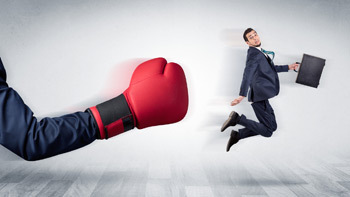 It is obvious that even subtle conflict already costs companies thousands of dollars. The bigger question is how long are companies willing to let the subtleties bubble and percolate until they impact several budget lines over multiple quarters and years? Every company needs a budget line for conflict. Unfortunately, some companies believe that a budget line for conflict admits to problems in the workplace and its managers. Yet, as we’ve seen, most companies do have some level of conflict that would benefit from resolution, but a budget line for conflict is not only challenging to accept and implement it is even tougher to estimate. A company pays an employee $50K per year but that employee is only working at 80% capacity because they are in conflict with their manager. There are no obvious disciplinary issues, so the employee stays, nothing changes and it costs an additional $10K in overtime. After this goes on for a while, the employee hands in a doctor’s note for 12 weeks medical leave due to stress. It’s not feasible to hire and train someone for a 3 month leave. Instead, the other 4 team members reluctantly divvy up the work either for fear of reprisal or just because they are that good. Now these employees are paid their regular $50K wage to get 125% worth of work out of them. While doing more for a short period of time happens, it’s still not solving the conflict. Not only after 3 months will the conflict still exist, there may also be more conflict due to the increased workload for the 12 weeks. Each company deals with conflict differently. Some companies approach the problem by measuring it. They measure how long it lasts, how many employees it affects and how much it impacts sales. If these measures are minimal, they might wait for the conflict to “work itself out”. If measures are substantial they might ask HR to hand out warnings or discipline which still doesn’t resolve the issue and may lead to HR emergencies that are always a result of ignoring conflict. Other companies will instead bring in consultants or professionals to figure out the causes of conflict and implement solutions, which often works when directed at the true sources of the conflict. Or they may take the less-successful approach of assertiveness training for staff rather than dealing with the problem offenders. Regardless of approach and the degree of conflict, it never goes away on its own. What goes away are employees: they call in sick, take stress leave, only give 75% or quit to find work elsewhere. They may leave, but in their wake is the toxic environment which can bubble and percolate below the surface until it results in a full-blown emergency. Now is the time to get realistic about conflict in your company. Conflict, of any kind, is serious. It may not be talked about, but the constant tension and apprehension impacts everyone. Get beyond the presence of conflict and its cost. Shift into handling and stopping it by bringing someone in to assess and resolve the issues. This way, managers understand what part they play in contributing to conflict as well as their ability (or inability) to manage it as a leader. If you identify with this article, then your company is a prime candidate to address conflict. Contact us at pam@thepossibilities.ca or 604-349-8660 to discuss the problems that exist in your business. At Pam Paquet & Associates, we help managers excel and become great examples to others in leadership. Find out more about our Building Better Bosses Program. This entry was posted by Pam Paquet and is filed under Business Assertiveness, Communication, Employee Training. You can follow any responses to this entry through the RSS 2.0 feed. Both comments and pings are currently closed.